I got to revisit some “old friends” in the Archives at work today. These were old friends from the Dayton Metro Library, but they found me at my new job as an archivist at Wright State. They weren’t living people or current friends; not really friends at all, if I’m being honest. But in a way, they felt like friends at the time, so I consider them that, still. I’m talking about (long-dead) people whose papers I arranged & described. People who never knew me; who might not have even liked me (or I them) if we’d known each other in real life; but whom I hold in a special regard since I handled, (to some extent) read, and lovingly organized some of their most personal thoughts, little pieces of themselves committed preserved paper, and thereby history. The second “old friend” that I ran into today at work was Horton Howard (read my biographical sketch of him from Aug 2012 on this blog), an early Quaker settler of Ohio—and sometimes doctor—whose daughter Sarah was married to Dayton canal engineer Samuel Forrer; all of these people (and many others) have papers in the Forrer-Peirce-Wood Collection at Dayton Metro Library, which I processed in 2011-2012. And I thought, Oh that can’t be the same guy; that has to be a really common name, and I’m sure any number of “Howard”s have written medical books. 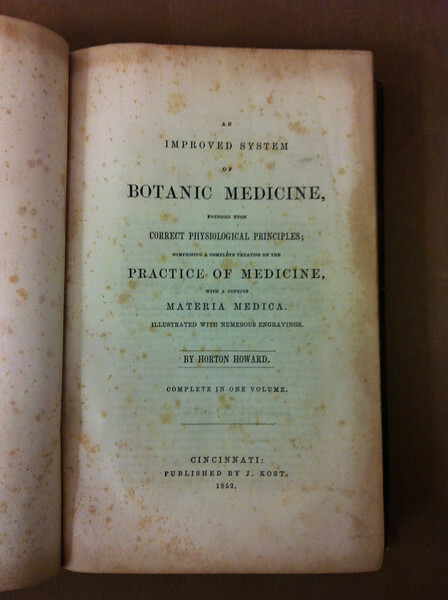 Then I saw the book right next to it—about botanic medicine—and, recognizing it was a subject that Horton had in fact studied and written about, I pulled it off the shelf to look. The publication dates through me for just a minute, knowing as I did that Horton died during the 1833 cholera epidemic in Columbus (as did his wife, a daughter, a son-in-law, and 2 grandchildren). But it turned out these were just reprints. One of them (I forget which one, sorry!) was like the seventh printing since 1832. 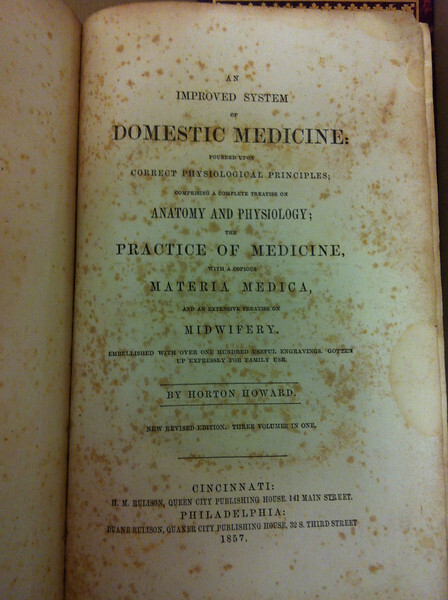 Now, I wasn’t QUITE as giddy about these finds as I might have been, since I had found the full text of the botanic medicine book online already and gleaned what I wanted to from it—-mostly from the fantastic preface that gives tons of info [block-quotes in the blog post] about Horton’s early life and medical knowledge (most of which was self-taught). 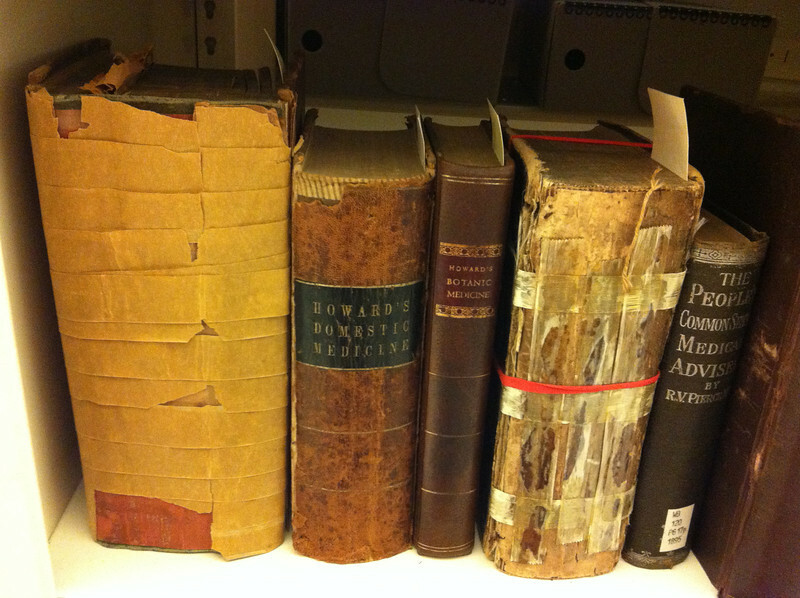 But it was still pretty darn cool to see real life, 3-D copies of the works, complete with old school leather covers (which were in much better condition than I would have expected for 150+ year old books), hold them in my hands, and, I don’t know…..just remember good old Horton. So, that’s my story for today. Hope you enjoyed it. Just goes to show, you never know when history will find you. David W. Schaeffer was born about 1825 or 1826 in Germantown, Montgomery County, Ohio. On April 2, 1850, in Montgomery County, Ohio, he married Frances Sophia Browning (born about 1826). Clarence E. Schaeffer (born about 1857; died Apr. 27, 1861). According to Dayton city directories, David’s occupation prior to the Civil War included being a clerk (1850, 1860-61), as well as later (1856-1859) operating with his brother Valentine a staple and fancy dry goods store, which was located on the east side of Main between Second and Third. After the Civil War broke out, David responded to the call for troops. David enlisted in the Union Army on September 15, 1861, signing up for three years of service. 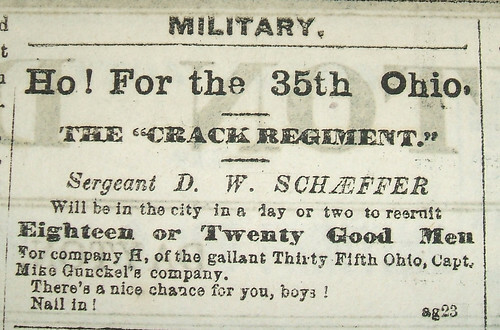 He was mustered in to the Thirty-fifth Ohio Infantry, Company I, on September 24, 1861, at Camp Chase. As a private, he was transferred to Company H, Thirty-fifty Ohio Infantry. He was appointed a first sergeant, and on October 24, 1862, was promoted to second lieutenant. On March 19, 1864, he became a first lieutenant, and on September 8, 1864, he was made captain. Peach Tree Creek (Georgia), July 20, 1864. David was mustered out of the army on September 27, 1864, at Chattanooga, Tennessee. Shortly after his return home, his wife Frances died of typhoid on November 21, 1864. Willie Schaeffer (born about Sept. 1871; died Mar. 29, 1872). After the Civil War, David was a collector for the Internal Revenue Service (1866-1869), and by 1870 he had become an insurance agent, selling both fire and life insurance, an occupation he continued right up until his death. The family was active in the Grace Methodist Episcopal Church, where David was an officer. For many years, from at least the mid-1850s until after David’s death in 1894, the Schaeffer family home was located on the southeast corner of Ludlow Street and Water Street (Monument Avenue). It was originally numbered 6 Ludlow Street but was later changed to 240 N. Ludlow Street. 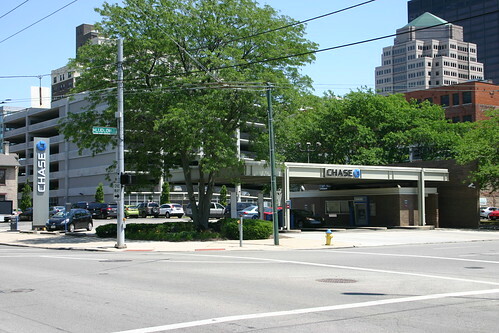 As of 2011, the Chase Bank drive-through is now located on the former site of the Schaeffer home. 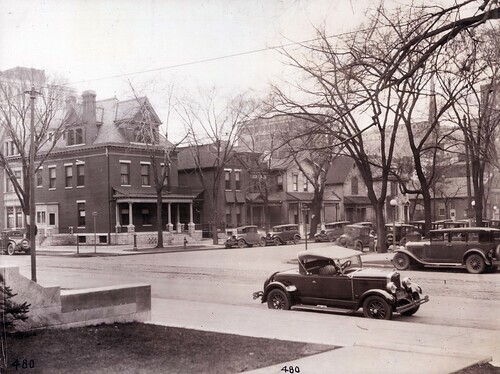 David W. Schaeffer home, 240 N. Ludlow, is the large house on the corner (far left) of this photo. 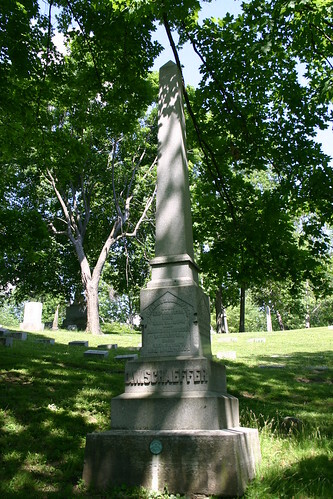 David W. Schaeffer died on September 5, 1894, in Dayton, Ohio. His second wife Catherine Starr Schaeffer died on February 5, 1909, in Dayton. David and both of his wives are buried in Woodland Cemetery, in Dayton, Ohio. This biographical sketch was originally written by Lisa P. Rickey in April 2011 for the Schaeffer Papers (MS-020) finding aid at the Dayton Metro Library, 215 E. Third St., Dayton, Ohio, 45402; phone (937) 496-8654. Additional information about the sketch’s subject can be found in that collection. For more information about the manuscript collection’s contents, please see the original PDF finding aid; the OhioLINK EAD Repository entry; or the WorldCat record. Arranging and describing a stand-alone manuscript collection (so people know what is there and where exactly to find it) is generally pretty darn cool, in an of itself. And there are always “tasty nuggets” to be found. But I think one of the coolest things in processing is when you get “crossover” between collections. By that I mean, you have collections where the people reference each other; or they both talk about the same event or person. I think I enjoy finding those things because it shows that history is not really linear; it’s not cut and dry. It’s more like a web – of people, places, things, events, movements. It’s actually fluid, and it’s expanding in every direction. Now that I’ve made your head explode with depth, let me get down to the nitty-gritty of some of the crossovers I’ve found recently in the Dayton Metro Library manuscript collections. Earlier today, as I was processing the Lowe Papers (MS-009), I came across several folders of newspaper clippings. In one, the Cincinnati Commercial boasted of having a first-hand account of the Battle of Murfreesboro, as reported by their correspondent “W. D. B.” I had to grin. He wasn’t named, but I knew that W. D. B. was William D. Bickham, a Commercial correspondent and later editor of the Dayton Journal. How did I know? Because I just finished processing the Bickham Collection (MS-017) a few weeks ago! In an opposite crossover between the two collections, the Bickham Collection contains a newspaper clipping noting that Manorah Lowe (mother of Thomas; widow of John W.) had been made the first “postmistress” of Xenia. I suppose I should not be surprised at these types of crossovers. After all, if you take two collections that focus on the same time period and geographic location, you are bound to have some overlap; that just seems logical. And yet, I still get excited about it when I find one. And of course, these are just some examples of the “crossovers” you can find within the Dayton Metro Library’s collections. That’s not even taking into account all the different collections at other institutions. Historians are probably out there shaking their heads, thinking, Lisa, you nut; this is what we do all the time. We go out and look for all the resources we can find on a particular person, place, thing, event, movement, etc., so we can write about it. Maybe I just think of it differently because of the difference in what I’m trying to do when I “find” these connections. I usually find them in the course of processing an individual collection. I’m just working with that collection, trying to get a grip on what is in it, why it’s important, how to arrange and describe it so that people (*cough*historians/researchers*cough*) can find what they need/want in it (if it’s there!). And then I will happen upon something that reminds me of something I saw in another collection. I wasn’t looking for it; I just remember seeing something like it somewhere else. In any event, I think these little “crossovers” are fun, so I thought I’d share a few of them with you. I’m sure there are many others. But I tend to notice the ones in collections I myself processed. You don’t always notice them unless you have waded through the entire collection yourself. The collections discussed here are publicly available for research at the Dayton Metro Library, Main Library, Local History Room, 215 E. Third St., Dayton, OH 45402. For more information on the collection, contact the library, or feel free to leave a comment on this blog.